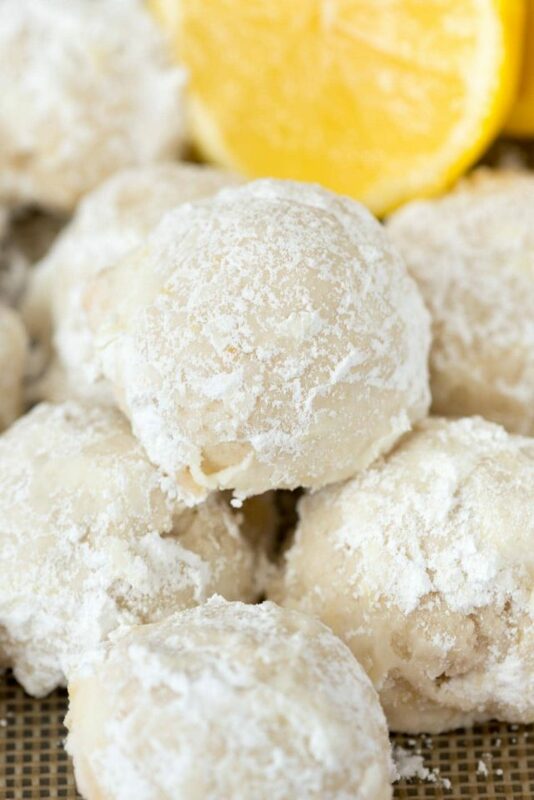 Lemon Snowball Cookies – an easy wedding cookie recipe filled with lemon zest, juice, and extract. 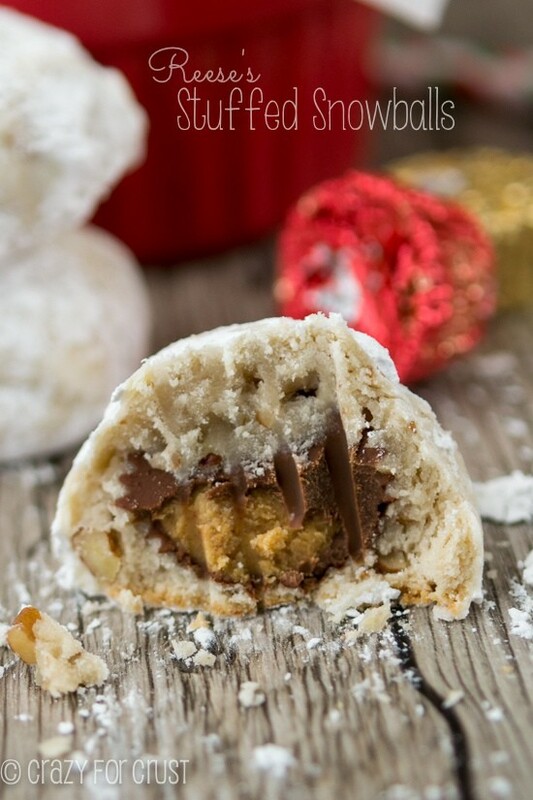 These are the perfect tea cake cookies and a delicious addition to a holiday cookie platter. Last week our annual American Girl Doll catalogue came. I always look forward to that day because I can usually write an entire blog post about the insanity that appears on the pages. Like the time I wrote about the $300 ice cream parlor (for dolls) and the VW Beetle that costs more than my car payment. Jordan has loved those dolls for years and even though I don’t agree with paying $30 for a doll swim suit, I’m happy to spend the money to get a dolls hair brushed by a professional, because the longer I do that, the longer Jordan will play with dolls. Little girls play with dolls. Girls that play with dolls don’t like boys and don’t turn into nasty teenagers. The arrival of the catalogue, however, was bittersweet this year. You see…last week Jordan had me take all of the doll stuff out of her room. The dolls, the clothes, the bunk bed my dad made…they’re all now in the garage, sitting on a shelf…collecting dust only to be used for the occasional play date with a younger friend. And just like that, my little girl who plays with dolls is no more. No more obsessing over the American Girl catalogue…no more tea parties…no more shopping for outrageously expensive doll lunches that are allergy free. It made me a little teary, if I’m being honest. What’s next…BOYS? Something that never changes? The love y’all have for my Mom’s Russian Tea Cake recipe. That one recipe, while so normal (and eerily similar to Betty Crocker) has satisfied so many people. They’re a staple in our house at every holiday. I’ve fallen in love with tinkering with the original recipe, just because that’s what I do. There were the Stuffed Snowballs (with peanut butter cups), the ones with chocolate chips instead of nuts. I turned them into chocolate and pumpkin spice and stuffed them with Rolos. I’ve even made them strawberry flavor and taste like cake batter…all from one little cookie recipe. I have a few more Snowball Cookie flavors to share with you over the next few months. First up: Lemon Snowball Cookies. My most favorite version of all! 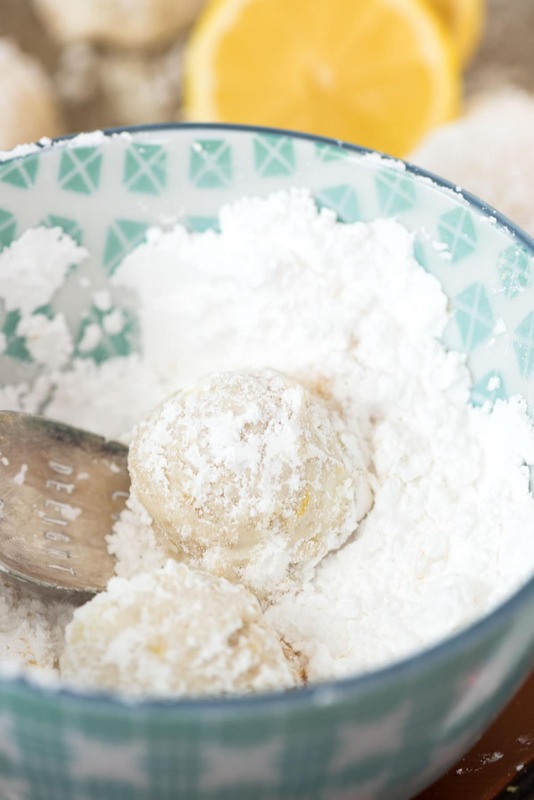 The lemon snowball cookies recipe is nut-free, so they’re perfect for those with allergies. 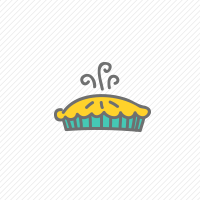 The lemon flavor comes from lemon juice and zest in the batter, as well as a touch of lemon extract. There’s also lemon zest in the powdered sugar you roll them in. 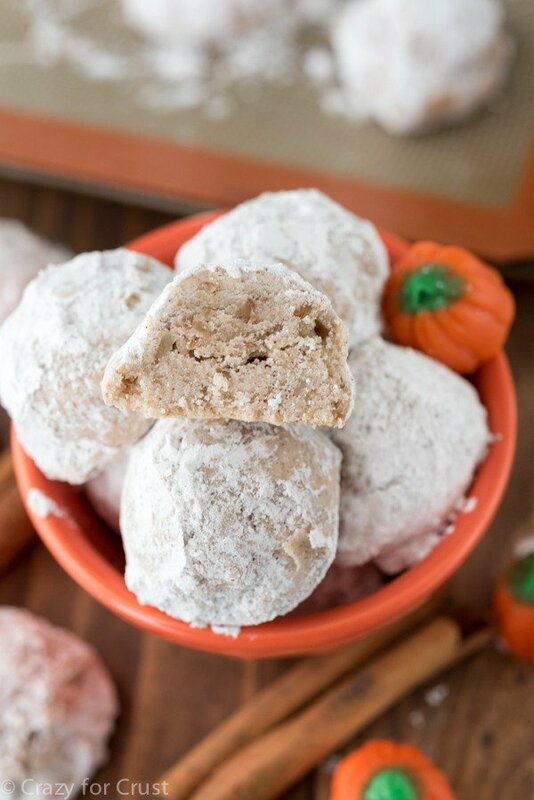 Snowballs, tea cakes, wedding cookies, whatever you call them, they’re always dependable because they’re always delicious. And they’re easy to make! Just a few ingredients, no eggs or leavening, mixed for a few minutes and baked. No chilling needed, no special ingredients. There’s a reason why they’re such a popular cookie: because they’re addicting. Do NOT pack your flour or powdered sugar. Do NOT use anything besides REAL butter. Margarine and butter spreads need not apply. Because there is a lot of flour in this batter and not a ton of liquid, it takes time for it to come together. If you’re using a stand mixer, this will happen pretty quickly. If you’re using a hand mixer or beating by hand, it will take a long time. Just keep mixing and the dough will form a thick cookie dough. Now that I’ve made to-die-for lemon snowball cookies, I can’t wait to try other citrus flavors…orange with chocolate chips or key lime with macadamia nuts!! Lemon Snowball Cookies - an easy wedding cookie recipe filled with lemon zest, juice, and extract. These are the perfect tea cake cookies! Beat butter, powdered sugar, lemon juice, lemon extract, and salt until smooth, then stir in lemon zest. Add the flour and mix until a stiff dough forms. If you're using a stand mixer, this will just take a minute or so. If you're using a hand mixer it will take much longer. Scoop tablespoon sized cookies onto your cookie sheet. These don't spread so you can crowd them a bit, leaving about 1-2" between cookies. Bake for 8-12 minutes, rotating pans halfway through baking, until the cookies are no longer wet looking. Cool 10 minutes before rolling in powdered sugar. Stir powdered sugar and lemon zest together in a bowl. Roll cookies to coat. If desired, do a second roll once they're completely cool, so they're perfectly white. Store cookies in an airtight container for up to 3 days or freeze for up to one month. 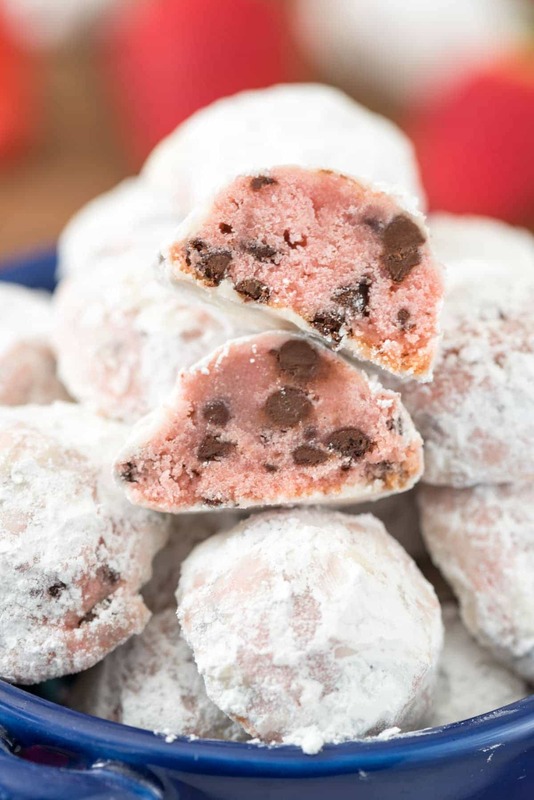 CHECK OUT ALL OF MY SNOWBALL COOKIE RECIPES HERE. I join you in the sad part about no more dolls, but I’m glad about these lemon treats! Make this same tea cake every year as well and done my own chocolate chip version too which I dust with a mix of powdered sugar and unsweetened cocoa (so good). Excited to try this lemon version, but one question, does the zest keep the powdered sugar from drying? Since the zest has oil, I’m thinking it would make the sugar stay damp. Could more zest just be added to the cookie dough without compromising the texture? I didn’t notice a problem with the zest in the powdered sugar, but you can omit and add more in the cookie if you like! I still need to try that. Let me know if the GF flour works! I am very new to baking. Can you tell me why they only last 3 days if not frozen? I can only speak to my experience since I’m not a food scientist, and 3 days is as long as they ever last before we eat them all. Hi, thanks for the recipe. I was wondering would it still taste the same if I omit the salt and use salted butter instead. Thanks and keep doing a great job! Yes that will work! Enjoy! Hello! Thank you for this recipe! My kids loved the cookies. I made them twice in 3 days! The only problem I have is that they spread a little and look like melted snowballs. Taste and texture are great. I followed the recipe to the letter. I used a hand mixer. Oven temperature 350. I just don’t know! It could be that my cups are different from yours and therefore are not in proportion with the amount of butter. Any tips will be much appreciated! Possibly the butter is softer than mine when you make them. Try chilling the balls a bit before baking; that should help! I make these cookies every year but thought your lemon version sounded so good! The problem I encountered was adding lemon zest to the powdered sugar. The zest makes the sugar clump up and it won’t stick to the cookie. I ended up saving that sugar and making a second batch, so it wasn’t a loss! Weird, I didn’t have that problem! Glad it worked out. Hi just made these. I changed the weights into grams because I’m in the UK and I used plain flour (which I’ve found out is all purpose flour). As with an earlier comment my cookies spread but I did use room temp butter so I’m going to try again in a few days with butter from the fridge and I’ll cool the dough before I cook. I cooked at 180 for 10 min. This may be a stupid question but if making with orange or lime juice, would you then use orange/lime extracts? I am anxious to try some of the cookie receipes. I make a lot of cookies and give as gifts for Christmas gifts to a lot of the people where I live. They call me the Cookie Queen. Thank you for posting them I will try many of them this Christmas. Merry Christmas to you. And your family. ? Do you sift your flour or your powdered sugar? It was very easy to make. For those whose dough didn’t form together, mine was all crumbly but once I knead the crumbs together it formed into a dough quite well. I rolled them into balls and baked for about 10 minutes. The bottoms of my cookies were nicely golden. Unfortunately for me it just wasn’t that lemony for me. Maybe I need to add more lemon extract. This cookie is great for those who have to watch their sugar intake, it’s not too sweet. I added a little citric acid to the powdered sugar coating for a little extra zing.